We investigated teacher learning within a professional development (PD) workshop series on computational thinking (CT) for elementary-level mentor teachers. The purpose of the PD was to prepare mentor teachers to support preservice teachers in integrating CT into their classroom practice, toward the broader goal of advancing CT for all in the early grades. We examined the ways in which participants collaboratively built on existing professional knowledge as they engaged in professional learning activities designed to introduce CT and related pedagogies for elementary science education. Our data sources were field notes, artifacts, drawings, written reflections, and focus group interviews. We describe how participants developed new understandings of CT integration and made connections to existing professional knowledge of their students, their curriculum, and their school contexts. We discuss implications for teacher learning and PD design relevant to CT, and make recommendations for future research. Hestness, E., Jass Ketelhut, D., McGinnis, J.R. & Plane, J. (2018). Professional Knowledge Building within an Elementary Teacher Professional Development Experience on Computational Thinking in Science Education. 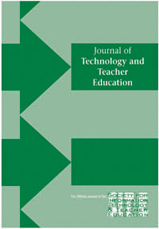 Journal of Technology and Teacher Education, 26 (3), 411-435. Waynesville, NC USA: Society for Information Technology & Teacher Education. Retrieved April 23, 2019 from https://www.learntechlib.org/primary/p/181431/. Angeli, C., Voogt, J., Fluck, A., Webb, M., Cox, M., Malyn-Smith, J., & Zagami, J. (2016). A K-6 computational thinking curriculum framework: Implications for teacher knowledge. Journal of Educational Technology& Society, 19(3), 47. Barr, V., & Stephenson, C. (2011). Bringing computational thinking to K-12: What is involved and what is the role of the computer science education community?. ACM Inroads, 2(1), 48-54. Bower, M., & Falkner, K. (2015, January). Computational thinking, the notional machine, pre-service teachers, and research opportunities. In Proceedings of the 17th Australasian Computing Education Conference (ACE 2015) (Vol. 27, P. 30). Jaipal-Jamani, K., & Angeli, C. (2017). Effect of robotics on elementary preservice teachers’ self-efficacy, science learning, and computational thinking. Journal of Science Education and Technology, 26(2), 175-192. Lee, O., & Fradd, S.H. (1998). Science for all, including students from nonEnglish-language backgrounds. Educational Researcher, 27(4), 12-21. McGinnis, J.R., Ketelhut, D.J., Hestness, E., Jeong, H., & Mills, K. (2018, March). Programmatic model building in undergraduate elementary science teacher education for computational thinking. Interactive poster session presented at the annual meeting of NARST: A Worldwide Organization for Improving Science Teaching and Learning through Research. Atlanta, GA.
Morreale, P., Goski, C., Jimenez, L., & Stewart-Gardiner, C. (2012). Measuring the impact of computational thinking workshops on high school teachers. Journal of Computing Sciences in Colleges, 27(6), 151-157. Mouza, C., Yang, H., Pan, Y.C., Ozden, S.Y., & Pollock, L. (2017). Resetting educational technology coursework for pre-service teachers: A computational thinking approach to the development of technological pedagogical content knowledge (TPACK). Australasian Journal of Educational Technology, 33(3), 61-76. National Research Council. (2010). Report of a workshop on the scope and nature of computational thinking. Washington, DC: National Academies Press. Hestness, Ketelhut, McGinnis, and Plane states. Washington, DC: National Academies Press. Orton, K., Weintrop, D., Beheshti, E., Horn, M., Jona, K. & Wilensky, U. (2016). Bringing Computational Thinking into High School Mathematics and Science Classrooms. Proceedings of the International Conference of the Learning Sciences (ICLS) 2016. Singapore. Stephenson, C & Barr, V (2012). Defining Computational Thinking for K-12. In Computer Science Teachers Association (CSTA) and Association for Computing Machinery (ACM): Computer Science K-8: Building a Strong Foundation. CSTA & ACM: New York. Vygotsky, L.S. (1978). Mind in society: The development of higher mental process. Cambridge, MA: Harvard University Press. Weintrop, D., Beheshti, E., Horn, M., Orton, K., Jona, K., Trouille, L., & Wilensky, U. (2016). Defining computational thinking for mathematics and science classrooms. Journal of Science Education and Technology, 25(1), 127147. Yadav, A., Zhou, N., Mayfield, C., Hambrusch, S., & Korb, J.T. (2011, March). Introducing computational thinking in education courses. In Proceedings of the 42nd ACM Technical Symposium on Computer Science Education (pp. 465-470). ACM.